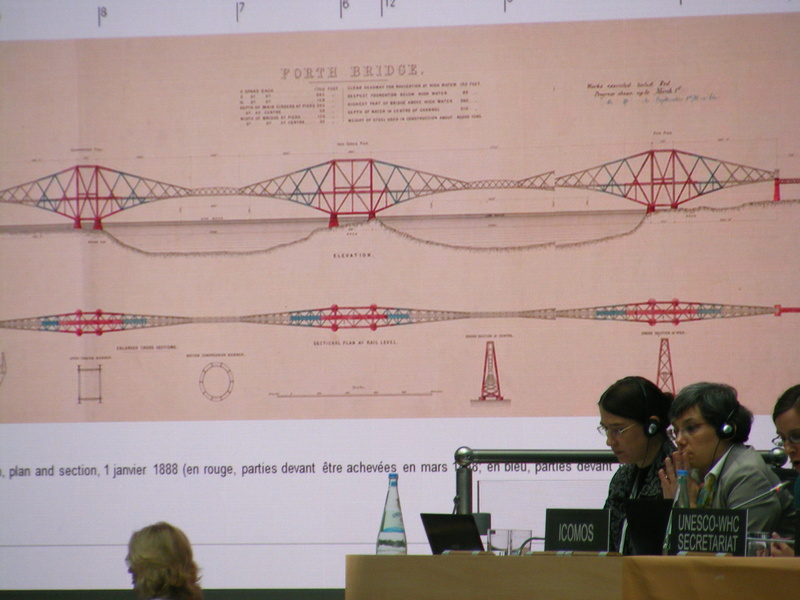 Mark Watson from Historic Scotland talks about his experience at the World Heritage Committee meeting in Bonn representing the newly inscribed Forth Bridge World Heritage Site. 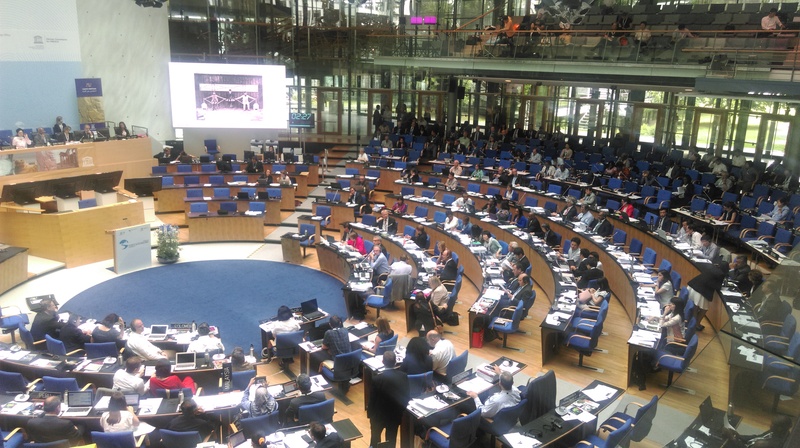 The World Heritage Committee met in Bonn, Germany, in July 2015. It was fascinating to see the relish with which diplomats use cultural and natural heritage to achieve soft, sometimes not so soft, diplomacy. There was a little contretemps about the place of human rights in the World Heritage Committee (properly affirmed by Portugal) and some depressing scenes from Yemen, Syria and Iraq, the latter subject of a UNESCO publication. Each day saw a regular good natured demo by Greenpeace in respect of two natural sites, Wrangel Island and the Great Barrier Reef, and also one mounted by Koreans. The Operational Guidelines were reviewed line by line (e.g. to achieve gender equality, taking out all references to mankind, except in relation to man-made disasters) and the second cycle of periodic reporting concluded with the completion of the European and North American reports, with Chris Young now at the helm. The Committee discussed and then included 24 cultural, one mixed and two natural sites in the World Heritage List, others being rejected, deferred, referred or having boundaries changed. It is noticeable that the committee, formed by states’ parties, if faced with a recommendation for deferral, often edged it into referral, or for referral, would often push it up to inscription. Some members were happy to acknowledge having recently visited a nominated site on the other side of the world. 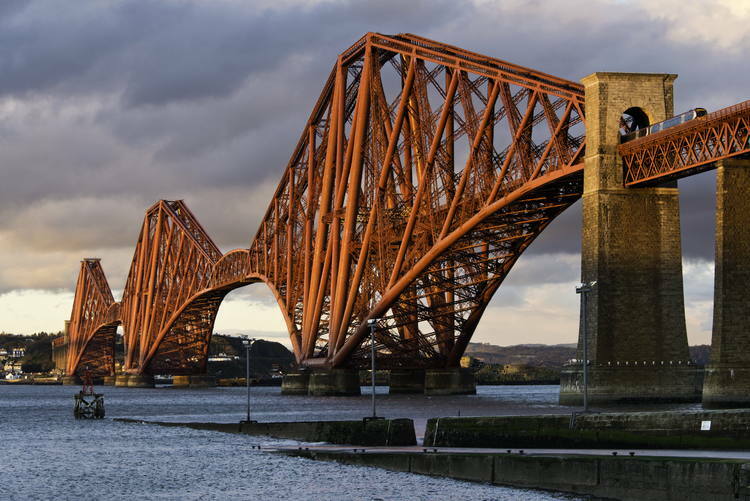 In respect of the Forth Bridge, Historic Scotland wrote the nomination in consultation with the Forth Bridges Forum , comprising local authorities, community councils and others, and was represented in Bonn by Miles Oglethorpe and myself. Network Rail, Transport Scotland, Historic England, DCMS and DFID (the UK Ambassador to UNESCO) were also represented. “an outstanding structure of the 19th century, an example of human ingenuity and labour. We further congratulate the UK for the conservation of this bridge that allows continuous use since its inauguration in 1890. The World Heritage will certainly be improved with the inscription of the Forth Bridge” (Portugal). On successful listing, Marco Biagi, Minister for Local Government and Community Empowerment in the Scottish Government, presented a very apposite two-minute speech, and this, the first UK inscription since 2009, was greeted with relief by all concerned. The Forth Bridge comes up 2 hours 25 minutes in. For interest, Michelle Thompson MP (Edinburgh, SNP) has submitted an EDM supporting the Bridge WH listing. The 39 signatories so far listed include some interesting names such as Peter Grant and Alex Salmond. I would expect the list to grow to a minimum of 65 given that all of the 56 SNP MPs are likely to sign up and there are already 9 signatories from other parties with many more expected. Early Day Motions (EDMs) are formal motions submitted for debate in the House of Commons. EDMs allow MPs to draw attention to an event or cause. MPs register their support by signing individual motions. The more that sign up, the greater the chance that the matter will be debated in the chamber.